Visited States Map: States Visited Map, States Ive Been To Map, Map of States Visited. How Many States Have I Been To? Use this free mapping tool to display the states that you have visited, driven or ridden through. 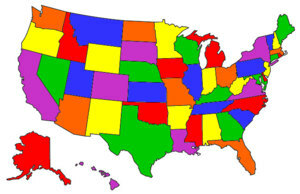 Drivers, motorcycle riders, car touring enthusiasts: Create a color state map to show where you have travelled. Instructions: Check the states that you have visited, select a map size, then click Draw Map to create your own customized map of visited states. Right-click on your customized map to copy the map or save it to your hard drive. Then upload your customized visited states map to your own website, Facebook or Instagram.